A bit of planning and research can mean the difference between a good vacation and an extraordinary one! Wander wisely in Port Dickson by learning some basic facts about it before you dash off. To help you find your feet, Port Dickson lies 45 miles (72 kilometers) to the south of the prominent city of Kuala Lumpur. It shouldn't be too difficult to make some new buddies in this corner of Negeri Sembilan. It's home to around approximately 89,000 locals. 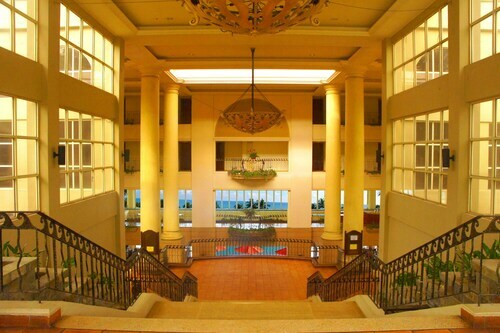 Gain undeniably good savings on Travelocity's Port Dickson accommodation and airfare deals. You'll also have plenty to pick from with more than 400 airlines and 665,000 properties. Our Customer 1st Guarantee offers the added comfort of 24/7 personal assistance on everything from accommodations and airfares to car rentals and experiences. Found a better deal? We'll meet the price and refund the difference^. With no hidden charges from us, you never need to stress about changing your vacation plans. And as long as you get in fast, many accommodations won't charge you a fee either^. 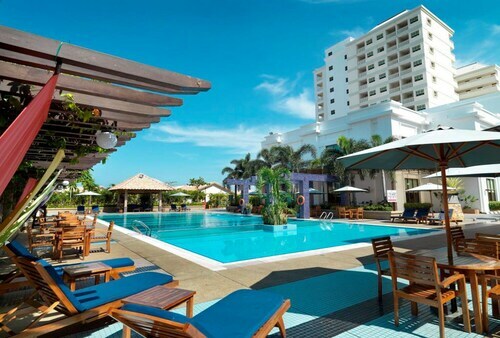 With a decent range of 16 properties available for booking on Travelocity, you can afford to be picky in Port Dickson. But remember — the sooner you reserve your accommodations, the faster you can concentrate on planning those adventures you've been dreaming about. When you have all those fantastic vacation experiences to organize, who wants to waste time scouring the web for a place to stay? Don't worry, we've done the hard work for you. The Grand Lexis Port Dickson and Lexis Hibiscus Port Dickson are a few of our top properties in the area. Where do you fly into for Port Dickson? Fasten your seatbelt, stow your tray table and get ready to say hello to Port Dickson! Once the wheels hit the tarmac at Kuala Lumpur International Airport (KUL), the busy main streets will be only 17 miles (27 kilometers) southeast of here. Can I rent a car in Port Dickson? Stroll through Port Dickson and experience its unique culture. If you plan to head a little further afield, securing a rental car via Travelocity is a great choice. There's no need to waste time trying to work out the cheapest way into town. Pick up your car from the Kuala Lumpur International Airport area and save yourself the stress. Europcar and Avis are waiting nearby to help you find something that suits your needs. History is full of astonishing stories to be told and plenty of lessons to be learned. Call in at Fort Lukut and get an insight into the past. Like more ideas? The world as we know it has been indelibly marked by war. Spend some time at Port Dickson Army Museum to gain a better understanding of the great battles of the past. But that's not all there is. Constructed to worship one or many gods, temples offer visitors an engrossing peek into another way of life. Learn about local beliefs as you walk around the sacred sanctuary that is Sri Anjeneayar Temple. Port Dickson has loads of things to see and do, but if you're wanting to branch outwards, you're in luck! You've got world-renowned attractions just a stone's throw from here! 35 miles (56 kilometers) away is One City. Many people use this destination as a base to access the renowned attraction, the Shah Alam Blue Mosque. This Port Dickson hotel is on the beach, 2.5 mi (4 km) from Cape Rachado Lighthouse, and within 6 mi (10 km) of Admiral Cove Marina and Port Dickson Ostrich Farm. Telok Kemang Square and Sri Anjeneayar (Hanuman) Temple are also within 9 mi (15 km). 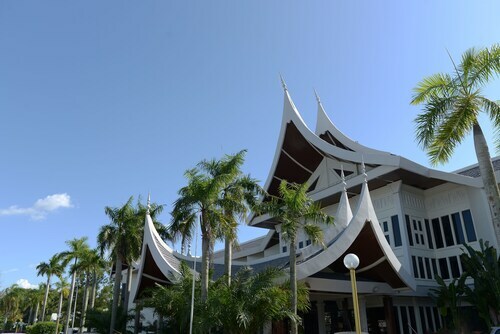 Situated in Port Dickson, this luxury resort is 2.6 mi (4.1 km) from Fort Lukut and within 9 mi (15 km) of Port Dickson Army Museum and Sri Anjeneayar (Hanuman) Temple. Admiral Cove Marina and Telok Kemang Square are also within 12 mi (20 km). 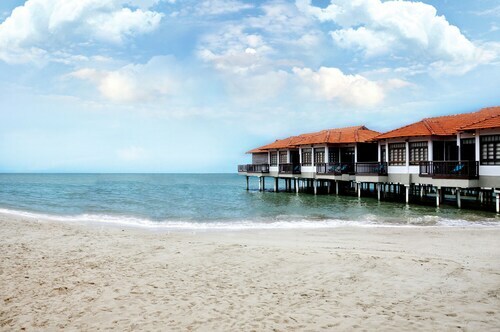 Set on 23 acres of tropical coast, facing the Strait of Malacca, this 4-star resort sits along 2 private beaches. 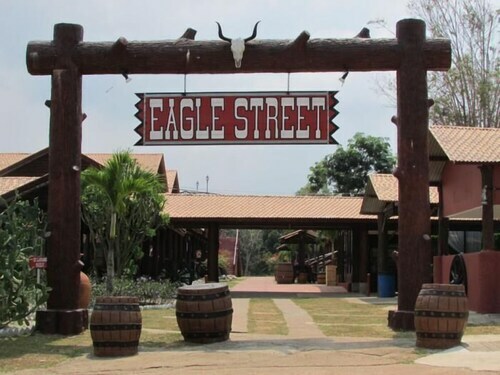 The town of Port Dickson and the Port Dickson Ostrich Farm are a 15-minute drive. 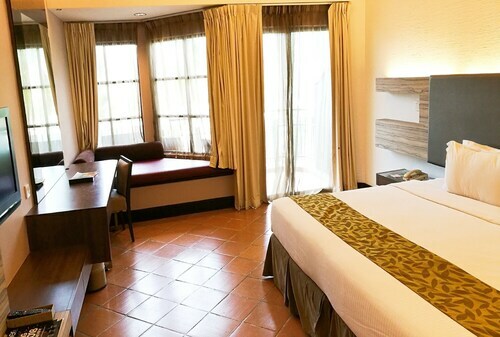 Situated in Port Dickson, this hotel is within 9 mi (15 km) of Port Dickson Ostrich Farm, Cape Rachado Lighthouse, and Telok Kemang Square. Admiral Cove Marina and Sri Anjeneayar (Hanuman) Temple are also within 9 mi (15 km). Nestled on the beach, this Port Dickson hotel is within 1 mi (2 km) of Sri Anjeneayar (Hanuman) Temple and Admiral Cove Marina. Port Dickson Army Museum and Telok Kemang Square are also within 3 mi (5 km). This hotel sits upon 36 hectares of tropical gardens, and includes a private 3-km stretch of sand. The main town of Port Dickson is a 20-minute drive away, and Kuala Lumpur is just over an hour away. 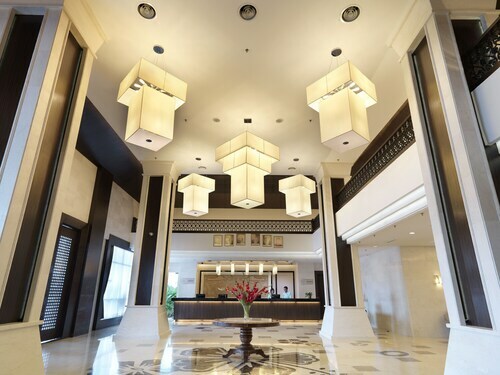 Located in Port Dickson, this beachfront hotel is in the city center, 2.8 mi (4.4 km) from Port Dickson Army Museum, and 3 mi (4.8 km) from Sri Anjeneayar (Hanuman) Temple. Admiral Cove Marina and Fort Lukut are also within 6 mi (10 km). This family-friendly Port Dickson resort is located near the beach, 2.7 mi (4.3 km) from Fort Lukut, and within 9 mi (15 km) of Port Dickson Army Museum and Sri Anjeneayar (Hanuman) Temple. Port Dickson Ostrich Farm and Telok Kemang Square are also within 12 mi (20 km).